Aahh… we just love our Late Summer Nepal High Himalaya Hand-Rolled Green tea from our beloved Nepal tea producer Jun Chiyabari. Hopefully new-comers will try this tea and join our many customers who have realized how fantastic it is. We work directly with Jun Chiyabari Ta Garden for the teas that we buy from them each year. 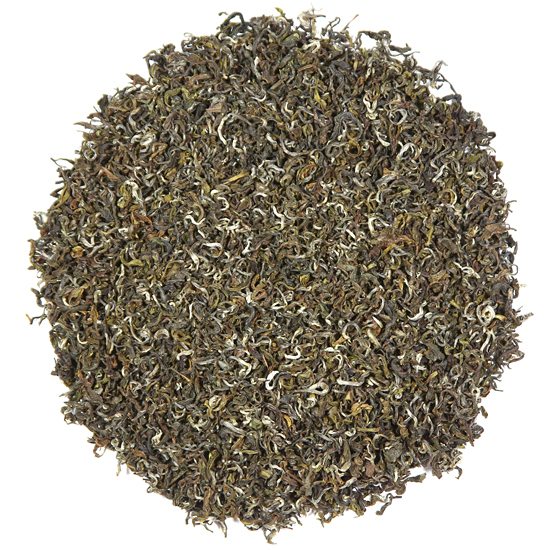 This tea is similar in appearance to that of our Nepal High Himalaya Hand Rolled Tips black tea offerings and also our Nepal Jade Oolong, but this batch of fresh leaf was processed in the tea factory into green tea. The leaf is from a late summer plucking – just the right time for large, juicy leaf with lots of flavor. 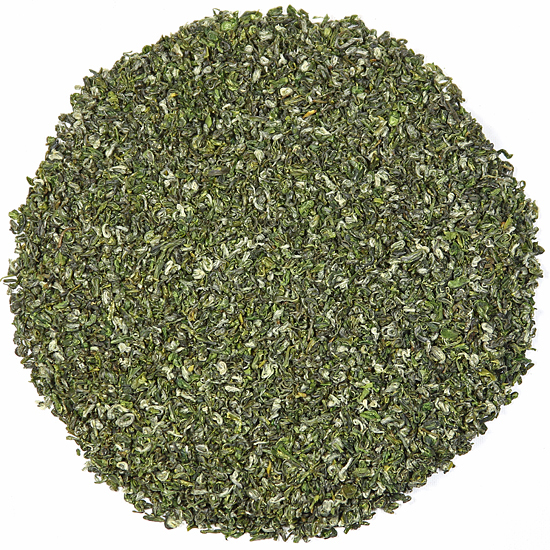 In making this green tea the fresh leaf was not allowed to oxidize – a step that is essential when making black tea. Instead, the leaf was given a short de-enzyming to allow a bit of water to evaporate from the leaf and soften it in preparation for the shaping that occurs later in the process. Immediately following this the fresh leaf was exposed to high heat – not enough to dry the leaf but just enough to stop – or ‘fix’ – further internal cell changes from occurring within the leaf. After this, the leaf undergoes a series of passes over the heat with time off the heat for rest. During rest, workers shaped the leaf by hand before returning the leaf to the heat for another round of heating & shaping. When the leaf has given off the proper amount of moisture and the shape has been memorized by the leaf, the newly-made tea is removed for slow final drying. The result of this hands-on work is this lovely green tea. 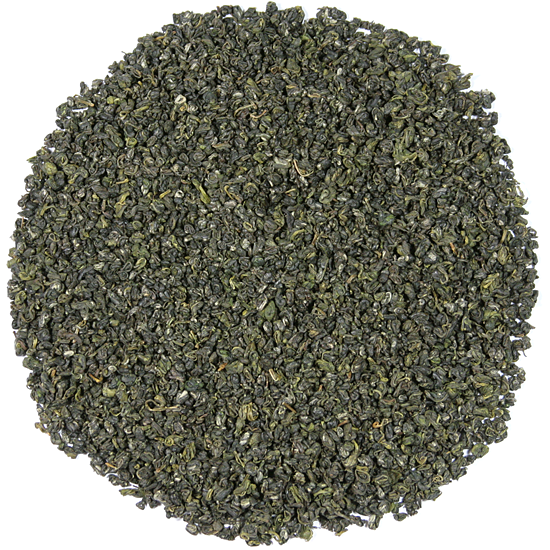 Our Nepal High Himalaya Hand-Rolled Green tea is not vegetal or grassy or green-green in color as is the tendency of Chinese, Japanese, or Korean green tea. It is uniquely Nepalese in style with a medium body, and a soft roundness in the cup. It has just a suspicion of a toasty flavor. 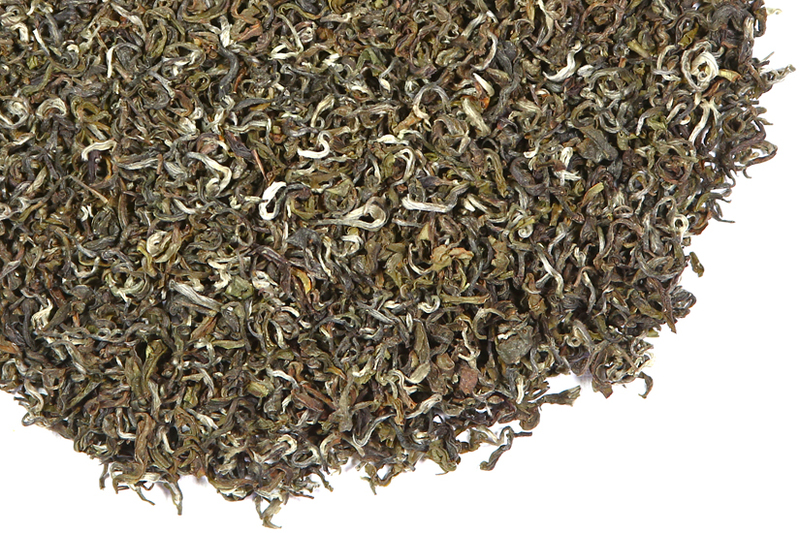 The high altitude location of its origin gardens at Jun Chiyabari ensures that this tea possesses a unique character from the slow maturation of the tea leaf in the clean, crisp air of these tea gardens in Nepal. The leaves of our H.H. Hand-Rolled Green are large, so if you measure by volume and not weight, be sure to use enough of them when steeping your tea. This delicious tea is the perfect choice for tea enthusiasts just becoming familiar with green tea; those who want to avoid strong tasting, astringent green teas; or simply a fantastic change-of-pace from the classic Chinese and Japanese spring green teas.